Graffiti Artist Spray-Paints Giant Animals onto Plastic Wrap in a Forest – Sig Nordal, Jr.
December 29, 2017 December 29, 2017 Sig Nordal, Jr. Most street artists use urban spaces as their canvas, but Moscow-based graffiti artist Evgeny Ches takes to the forest to create his art. Inspired by the work of French artists Kanos and Astro, Ches uses a technique called CelloGraff, where he stretches cellophane around two trees, and spray paints his murals onto the transparent film. Ches’s spray-paintings depict life-like wild animals—including a dinosaur, a polar bear, a monkey, and even a giant squirrel—that almost look as though they’re really living among the forest trees. You can find more of Ches’s work on Instagram, and watch his street art adventures via his YouTube channel. Graffiti artist uses a technique called CelloGraff to create life-like animal murals on plastic wrap in the forest. By not painting backgrounds, Ches’s graffiti animals appear to fit into the natural environment. Watch Ches create his Cellograffiti Dinosaur, and learn how you can create your own CelloGraff art. All images via Evgeny Ches. 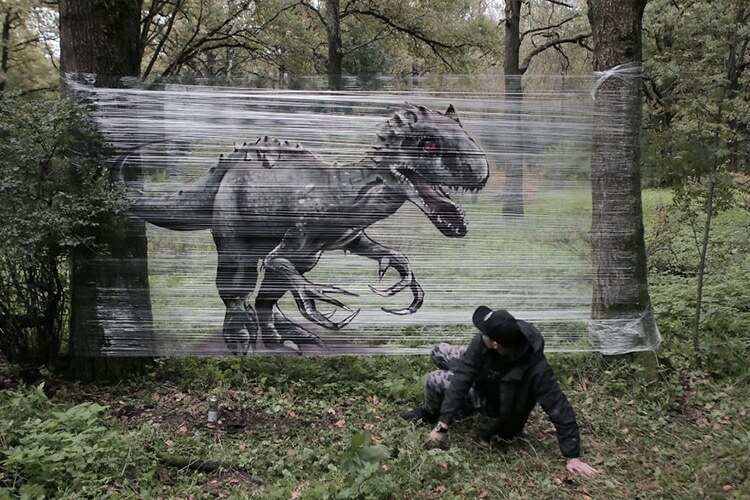 The post Graffiti Artist Spray-Paints Giant Animals onto Plastic Wrap in a Forest appeared first on My Modern Met. Next Article Merkel and other European leaders know that Trump’s rudeness and ignorance will only help unite Europe. In fact, resistance towards Trump is growing globally.